Monday threw water all over the embers of last week's fireworks. 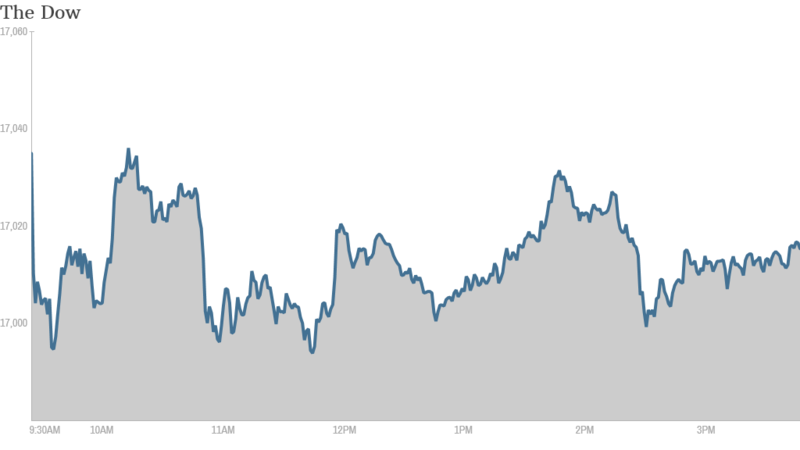 Stocks were in pullback mode with the Dow Jones Industrial Average down 44 points. The S&P 500 and Nasdaq Composite indexes were also lower, with the Nasdaq down about 0.8% and S&P 500 off 0.4%. Today's dip came after a record-setting close last week that saw Dow finish above 17,000 for the first time ever. The Dow managed to stay above 17,000 today, but barely, closing at 17,024. This week marks the start of "earnings season," which is when America's biggest companies release updates on their revenues and income and give a peek into the shape of the U.S. economy in the second quarter. More attention has shifted to the health of companies and whether their stock prices are truly justified. Related: Corporate profits: Can they keep going and going? 1. 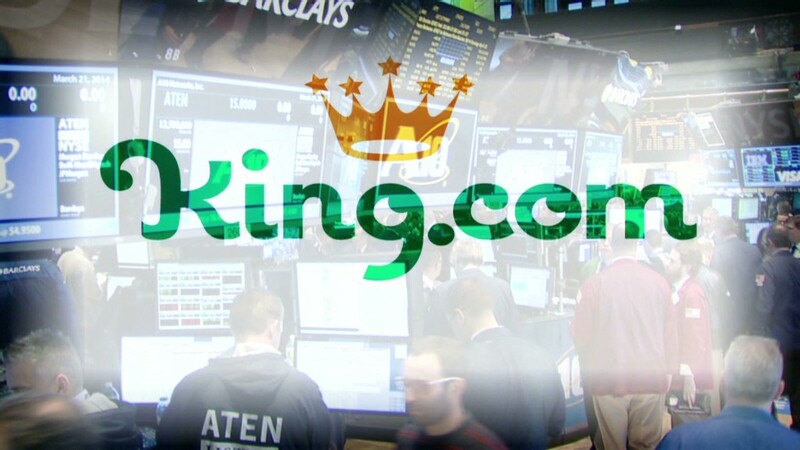 Not even KING for a day: King Digital (KING), the company behind the viral monster Candy Crush, enjoyed a brief moment of joy when it finally opened above its $22.50 IPO price more than three months after it started trading in late March. Shares on that disastrous first day dropped more than 15%. The stock opened about 4% higher this morning, but it swung to close over 5% lower. 2. Other tech movers: BlackBerry (BBRY)'s shares rose 5.6% today. The Economic Times of India reported over the weekend that the company would soon announce a joint health care services platform with tech firm Nathhealth. India is an important market for BlackBerry's Asia Pacific division, which is the smallest division but made 15.6% of the firm's revenue in the last quarter. "$BBRY To the moon, Alice, to the moon!" wrote StockTwits user rgb66rgb. Expedia (EXPE)'s finished 1.4% lower after it announced yesterday that it bought Australian travel website Wotif.com for $658 million. Australia-listed shares in Wotif, which operates throughout Southeast Asia, rose 25% on the news. Expedia recently hit an all-time high of $82. Several analysts have recently upgraded the stocks price target to above $90. 3. A juicy acquisition, an airline in descent and Petsmart throwing investors a bone: Archer Daniels Midland (ADM), a big food and commodities company, purchased Wild Flavors for about $3.1 billion. Wild makes the popular Capri Sun juice, among other things. ADM's stock is one of the rare bright spots in today's trading. It gained 1.6%. Delta (DAL) stock fell more than 4% Monday. Earlier in the day, the company told Bloomberg and the Associated Press that it would be reducing its air travel after Venezuela due to a currency dispute. In its most recent quarterly filing, the company said Venezuela hadn't repatriated about $180 million. Last week, the company released lower than expected travel numbers. Petsmart (PETM) stock rose about 2.5% Monday. The company said vaguely in a filing that it was considering ways to give money back to shareholders, though no concrete plans have been developed. 4. Rate hikes on the horizon? After Thursday's great jobs report, which showed strong employment growth, solid wage growth and a downtick in the unemployment rate, there's increasing speculation among Wall Street economists that the Federal Reserve will "tighten," or increase interest rates, sooner than they previously expected. Economists at Goldman Sach, (GS) JP Morgan (JPM), Bank of America (BAC), Citigroup (C) and Capital Economics all revised their predictions. Some say the rate hike could happen as early as Q3 2015. If the market misreads the Fed's timing, it might be bad for stocks as investors flee to safer assets. Though not everyone thinks so. "We don't expect share prices to plummet, as they did towards the end of, and after, the 1999/2000 tightening cycle," Capital Economics wrote in a note earlier today. "This is mainly because the valuation of the stock market is much less stretched now than it was during the dot com bubble." 5. Overseas markets: European stocks fell, with the FTSE 100 finishing over 0.6% lower. Asian stocks ended the day in mixed territory, though India's Sensex gained 0.5%.